Herbert Hoover’s memoirs (1951) documents the fact that Franklin D. Roosevelt (FDR) played a very dirty game of politics. There were rumors that FDR would confiscate gold. These rumors spread and people ran to banks to withdraw their funds. The night before the election in 1932, FDR denied that he would do such a thing. After FDR won the election, the real bank panic began. FDR would not take office until March 1933. The run on banks began as the Great Depression started. In 1929 alone, 659 banks closed their doors due to mismanagement and speculation. However, as the 1931 Sovereign Debt Crisis hit, the number of bank failures skyrocketed. By 1932, an additional 5,102 banks went out of business. Families lost their life savings overnight. Thirty-eight states had adopted restrictions on withdrawals in an effort to forestall the panic. Bank failures increased in 1933, and Franklin Roosevelt deemed remedying these failing financial institutions his first priority after being inaugurated. 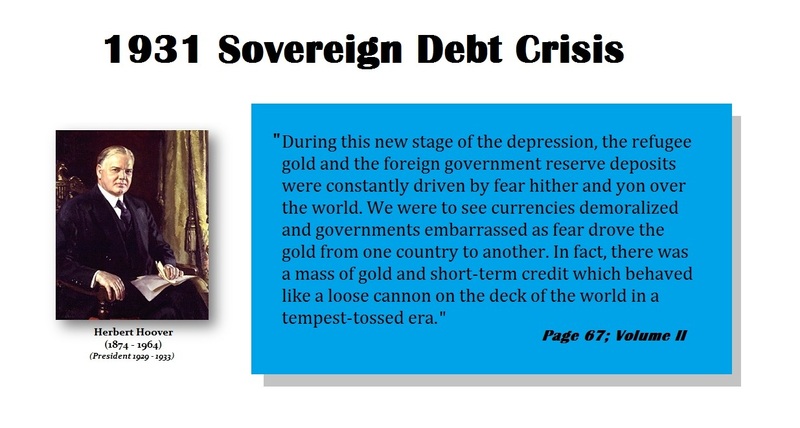 Hoover pleaded with FDR to please come out and address the gold confiscation rumors. At 1:00 a.m. on Monday, March 6, 1933 President Roosevelt issued Proclamation 2039 ordering the suspension of all banking transactions, effective immediately. He had taken the oath of office only thirty-six hours earlier. [N]o such banking institution or branch shall pay out, export, earmark, or permit the withdrawal or transfer in any manner or by any device whatsoever, of any gold or silver coin or bullion or currency or take any other action which might facilitate the hoarding thereof; nor shall any such banking institution or branch pay out deposits, make loans or discounts, deal in foreign exchange, transfer credits from the United States to any place abroad, or transact any other banking business whatsoever. For an entire week, Americans would not have access to banks or banking services. They could not withdraw or transfer their money, nor could they make deposits. The crisis had been a long time coming. In the three years leading up to it, thousands of banks had failed. But a new round of problems that began in early 1933 placed a severe strain on New York banks, many of which held balances for banks in other parts of the country. About 4,000 banks failed during this period alone bringing the total to over 9,000.